How Far is Sukhii 9? Sukhii 9 Apartments, aims to enrich lives by setting new standards for customer centricity, architectural design, quality, and safety. These Residential Apartments in Hyderabad comes with a view that is unbounded and captivating. Every nook and corner of the Sukhii 9 reflects beauty in its true sense. 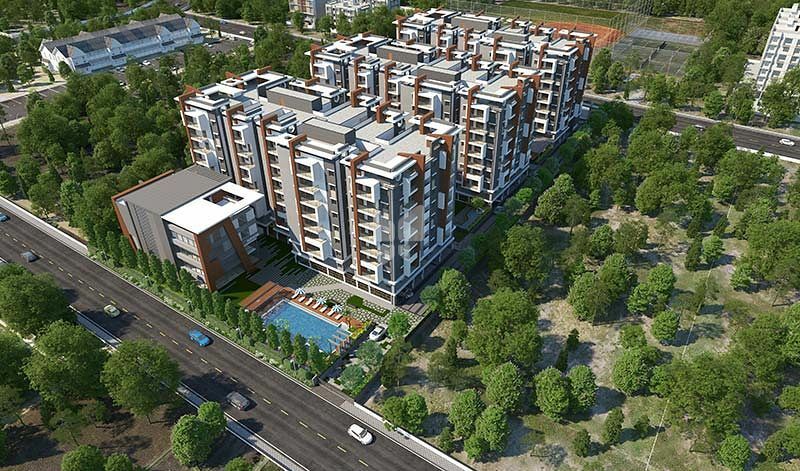 Sukhii 9 by Sukhii Group in Bachupally ensures privacy and exclusivity to its residents. The ambiance of Sukhii 9 is truly a marvelous sight to behold. Sukhii 9 is one of the best investments in Residential properties in Hyderabad. The Apartments in Sukhii 9 are strategically constructed keeping in mind the best of architecture both from inside as well as outside. From stylish flooring to spacious balconies, standard kitchen size and high-quality fixtures, every little detail here grants it an magnetic look. Sukhii 9 offers beautiful 2 BHK and 3 BHK Apartments in Hyderabad. The price of Apartments in Bachupally is ideal for the home-buyers looking for a property in Hyderabad. Seismic zone ll compliance RCC framed structure. Living, Dining :80*120mm vitrified double charged tiles. Master bedroom :60*120mm wood design vitrified tiles. Bathrooms :Glazed ceramic tile dado up to 7′ height. Utilities :Tile dado up to 4′ height. provision for fixing exhaust fan & chimney. Provision for geyser for hot water, RO water purifier,dish washer & washing provision in the utility area. Plumbing and sanitary lines design as per professinal MEP consultant’s design. Concealed copper wiring as per professionals MEP consultant’s design. provision for power outlets for air conditioners in all bedrooms. power plug for cooking range chimney,refrigerator,mixer/grinder in kitchen. Three phase supply for each unit &individual meter boards. one miniature circuit breakers (MCB) for each room at the main distribution box. Metered connections for consumption of electricity for each flat. provision in living room for each apartment. High speed passenger lifts & service lift with rescue device with V3F. 100% DG set backup for all rooms except AC and 15 Amp points. Sophisticated round the clock security system. Surveillance cameras at the main security,corridor,entrance of each blockto monitor. video door phone for each apartment for screening of visitors. fire hydrant & fire sprinkler system as per satutory norms. fire alarm & public address system in all floors & parking areas(basements). We are a group of motivated individuals with a common aim in mind: to deliver happiness. From constructing homes that you’ll love to cook up meals that will transform your lifestyle into a healthy one, we at Sukhii constantly strive to deliver what’s best suited to your needs. Maintaining an unwavering balance between happiness and health, our strength lies in our skill and dedication to delivering the best. Keep showering your love and trust in us while we shower you with happiness! Our homes are crafted with care and beautifully co-exist with nature. We make sure that happiness is not a state of mind, it’s a lifestyle. We believe happiness is real only when it’s shared. So, here is us, sharing all the happiness in the world with you! Welcome to Sukhii. Welcome to life.